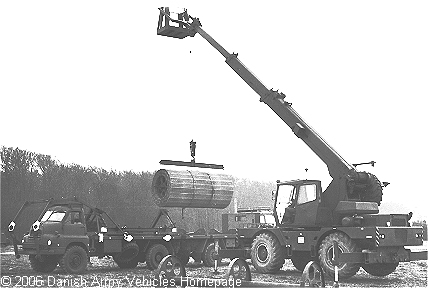 Danish Army Specific: A number of the Telekruiser rough terrain crane was acquired in march 1978 for the engineers. Primary function was to train operators, secondary to perform lifts needed. On the shown picture the is loading trackway onto a Bedford RLG. Historical: The Telekruiser was designed in USA, but produced in Germany. It was a civilian model, but with a few alterations to suit its military purpose. Length: 8.30 m (324 inches). Height: 3.70 m (144 inches). Weight: 20.560 kg (45.232 lb.). Engine: 4-cylinder GM Detroit Diesel, type 4-53N, 3.480 cm3 (212 cubic inches), liquid cooled. Horsepower: 130 at 3.000 rpm. Transmission: 2-speed torque converter, type GM Allison TT 2226-1. Fuel capacity: 150 liter (33 gallons). Additional: The telescopic boom could extend to 13.7 meters. The cab is mounted with a Eberspächer X2 heater. The Telekruiser was imported by "Nordisk Diesel A/S" in Copenhagen.